When tackling your money plan for your business, it can feel a bit overwhelming to get started. When working through your profit game plan, first comes your business budget then comes your cash flow plan. A cash flow plan is simply predicting the amount of money that will flow in and out of your business every month, months in advance, to make sure you don’t run out of cash. Cash is king. Without cash in your creative business, you can’t pay the bills, pay your people, pay your taxes and pay yourself. 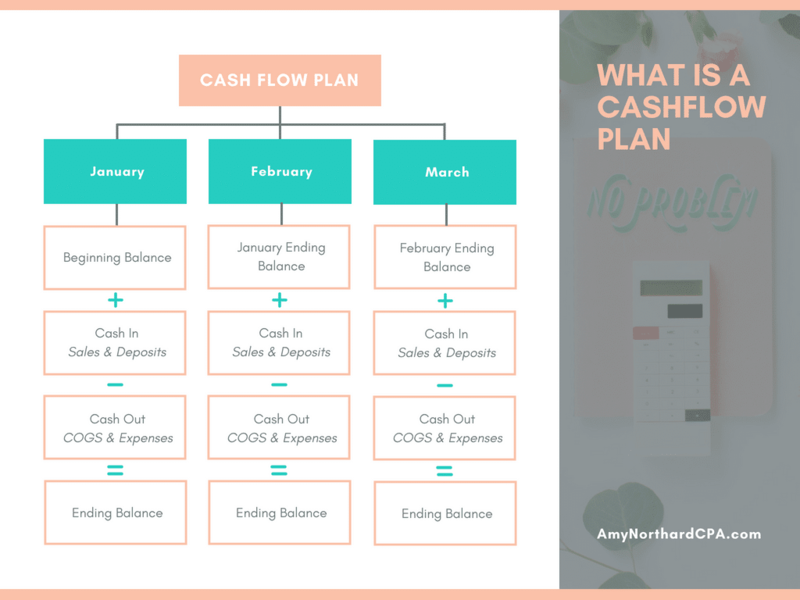 Having a solid cash flow plan can show you months in advance what your bank account balance will be based on your business budget (cash out) and sales you expect to come in (cash in). This is a great way to see if you need to increase marketing months in advance for a certain product or service you need to sell more of so you don’t run out of money. Or if you need to drastically decrease expenses. Or increase your prices. How to Prepare for Fluctuating Income? A cash flow plan is like a money map so you can make more strategic business decisions instead of knee-jerk reactions because you unexpectedly went into the red. We are creative entrepreneurs and small business owners. Our income fluctuates from month to month and season to season. A cash flow plan helps you prepare for those ebb and flows. I can hear your grumblings now. You didn’t know it was a thing. It sounds hard to do. It’s something else you have to keep up with. I hear you but if you want to have a heartbeat on the health of your business months down the road, you can’t ignore your cash flow. Here are some simple steps to do that and you can download a simple cash flow plan excel tool here to help you! Create a business budget so you know how much money your business needs on average to keep your doors open. Plan out what you think sales will be over the next few months. You can get a good idea by looking at the last few years of sales. Don’t forget to account for the cost of those sales (Cost of Goods Sold or COGS). Account for saving for taxes. Talk to your CPA about the percentage they recommend you save of profit. Define what you need to make or want to pay yourself. If you don’t think this is something you want to tackle yourself, you know I’d love to help you. We both know running out of money and not being prepared financially is a very scary thing. Just head over here and schedule a call to tackle your profit game plan.